In this series of 30 daily articles celebrating the upcoming 30th Anniversary of Super Mario, various members of the Nintendo Life extended family will share their memories and thoughts on the iconic franchise. Next up is reviewer and news contributor Tim Latshaw. 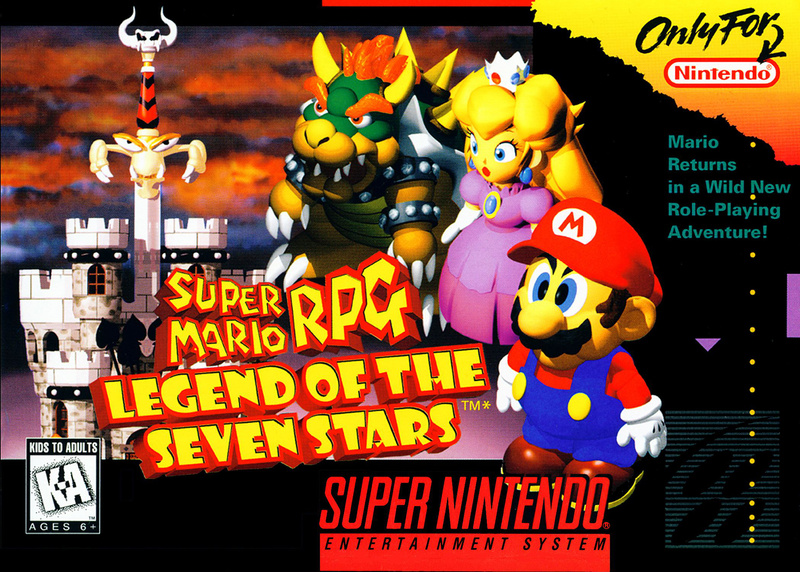 Super Mario RPG: Legend of the Seven Stars is technically a single-player game, but was often jury-rigged into a multiplayer experience whenever I showed it to a friend. We'd huddle around the SNES, each claiming a character in the party and passing the controller back and forth so we could enter a single attack or item use when it was their turn. Ownership of the third character would often be negotiated and alternated on a round-by-round basis. This was often Geno, because his coolness was way too prolific to fall under the hands of just one player. Perhaps this wasn't the most efficient way to go about playing the game, but it was one I didn't mind in the least. Super Mario RPG was such a fresh take on the Mario universe at the time that it begged to be shared. The fact it didn't see light in Europe until 2008 is a crime I would have cried out against in letters to Nintendo Power had only my younger, 1996 self been more globally aware at the time. Forgive me, my trans-Atlantic friends. So when Nintendo and Square's collaborative jam finally hit, the 3D rendered graphics were the initial bombshell. All these glorious-looking new areas to explore; an expansive world now connected by more than a series of world and stage numbers or maps of dots and squares. The Mushroom Kingdom set out before you actually felt like a kingdom! But what was even more mind-blowing to me and my friends reveals itself right in the beginning of the game. You charge into Bowser's Keep with Mario in traditional princess-saving fashion, reach the boss for the traditional fight… but then he starts talking to you. Yes, Baby Bowser gets a few lines in Yoshi's Island, but there was something much more magical about having a fully grown Bowser giving you attitude during the course of an actual fight. And of course he would have plenty more to say throughout the game, even as he ends up joining the party himself. Lots of characters talk, of course, from Peach to the Toads to individuals you never see in any other Mario game, and so much of it served to expand our views on these characters and what kinds of realms the Mario games occupy. Many of these influences rippled out to help shape elements of Mario games down the line -especially cousin RPG series Paper Mario and Mario & Luigi. For me, however, Super Mario RPG is where Bowser had his big break, casting off the mantle of being just the big, bad means to ending a game and truly becoming an essential part of the legacy. Seeing the personalities of the Mario series' most beloved characters become molded and shaped over time has become one of my favourite parts of experiencing the series, and even the little shines they receive in the more traditional and less talky instalments are entertaining to see. Ever since Super Mario RPG, though, I always look toward Bowser with the most anticipation. Whether he's a villain, anti-hero or simple rival, the complicated relationship he has grown to have with Mario and Co. is a blast. "I can't just be PALS with these cretins," Bowser laments during part of Super Mario RPG. "I've got an image to keep!" Ironically, this quote about sums up what the tyrant's image has become nowadays, the lovable jerk, and it's utterly fantastic. Bowser is my favorite character, and it's because of this game. Best RPG ever. I loved the characters and timed hits, would be great to see more RPGs do that. Square Enix should really release this sucker on the WiiU VC finally. I've always been a massive RPG fan, and I love all of the Mario & Luigi games, so maybe I should give this a try. Ugh, Japan exclusive on Wii U VC. This was the very first RPG I played, and it hooked me on the genre. I was attracted to it by the 3D rendered sprites, my little mind couldn't handle the awesome that was "3d Mario". So when I saw this in Toys R Us, I saved until I could buy it. I'm just glad I stuck with it, because it opened me up to a brand new genre. In retrospect though, most RPGs fail to hook me the same way. I believe it has to do with timed hits. It made the battles more interactive. Which is generally why I enjoy RPGs with little twists to battle mechanics. Legend of Dragoon, Paper Mario, Tales of Symphonia, Mario and Luigi, etc... Not to say traditional isn't bad, after all Chrono Trigger is my favorite game of all time. But I suppose the ATB gauge works in that sense. I've tried playing this a couple of times but I just can't get into it. The first 30 mins or so just loses me. I mean I love other RPGs like Pokemon, Chrono Trigger and Mother 3, so I really do think it's an issue with the design of this game and not me. Maybe it's just too slow to get started, or it's not particularly engaging, or the first few areas are just going through the motions, or whatever. Also; those rendered graphics always looked a bit rough in places imo, which can sometimes put me off wanting to force my way through the rest of a game if I'm not having a pleasurable experience just looking at what I'm doing. @Miles_Edgeworth Don't man. You gonna regret not doing this before. Seriously. Is THAT good. @Grumblevolcano You can download it on Wii mode though, I think. Aw man so many great memories playing this when it first came out! I still have my copy and I'm thinking its about time for another play through! Boshi was the best! I completed this game last summer vacation and wrote about the experience here. As a PAL gamer, knowing this was out in America but it would never see the light of day in Europe was just one of many childhood traumas. Glad things have improved since then. This game never came out in Europe We Europeans had to wait until it was available on the Wii Virtual Console or buy an American SNES along with the game. Never had a sequel, but it still influences the Mario RPGs of today, in a few subtle ways. Well, if it's on one region's VC, and was originally released elsewhere... I'd say it's only a matter of time before we see it. I still await for Square Enix and Nintendo to get their crap together and make a sequel. This is the game that really... got me into gaming. I enjoyed Sonic and Mario just as much as the next person, but the music, challenge, and characterisation behind this game was astonishing for my 8-year old self. I still love it! And even though I have enjoyed the Paper Mario series, they lack the charm this game holds. Can someone tell someone at Nintendo to please please please make this available on the Wii U VC!!!! I know its available on the VC through the Wii mode, but that's just a pain and it would be great to play on the gamepad. I still to this day want a sequel to this game. It was so amazing, and I'm sorry but Paper Mario and Mario & Luigi series are not the same. I hope I don't keep waiting for SMRPG2 for the rest of my life. ahhhh yes! my 1st rpg, and possible still my favorite (very close tie with xenogears). I hope they release this on virtual console, i can't get enough of this game, such good memories and music! I originally owned the cartridge back in 96. Played it at least once a year. Recently bought it on the Wii VC and have been playing it all weekend. Mario & Luigi series could take a note from this game. @Palom This. So much this. Edit: Forgot to quote for clarity. @umegames Same here (except for the part about Xenogears), my first and favorite RPG! Playing as Bowser for the first time in any game was mind-blowing at 11 years old. Geno's my favorite character though, and I've always wished I'd be able to play as him in another Mario game. NOTE: Did anyone else think of this game when they noticed Conception II's full title ends with "of the Seven Stars"? "Square Enix should really release this sucker on the WiiU VC finally." I already have the Wii VC version, but this would be awesome because it would finally give people like me who just can't get the Super Jump timing down to finally get the Super Jacket (via Save State). I managed to get the Attack Scarf, but never had the patience for 100 jumps. @daniruy wow, you have just increased my interest level by 1000%! Waiting for Wii U VC release. I've played the beginning of the game a couple of times but I lost my interest as soon as I started. I'm not sure why. Mario RPGs in general don't interest me as much as they used to. Still hoping that I can get back into them though. I loved my first playthrough of Paper Mario and Mario & Luigi: Superstar Saga. @DiscoGentleman Well; if you wanna be that way about—EVERYTHING is "technically" subjective. What I'm saying however is that it seems to have a slow start (unless I'm forgetting something here and the start area isn't kind of by-the-numbers and plodding) and slightly fugly graphics (there's a reason Miyamoto was totally against using this particular graphical style in Yoshi's Island). So yeah; I'm blaming the game. Edit: Actually; I remember now why I couldn't get into it. I kept dying on the first area, simply because I didn't even think to use a mushroom on any of the battles—because it's the first f*****g area! It's way too early to punish the player and push them back to the start of the section just for not thinking about that kind of stuff. So it's not "plodding", but just annoying and off-putting having to make my way through that area a few times, having to listen to Toad again each time, simply because I didn't think to worry about something I really shouldn't have to worry about so early in the game. They need to give you a bit more time to settle into the game before making stuff like that essential to even survive a few generic enemy battles. Also; in this day and age, the graphics and presentation aren't even going to maybe at least motivate you to want to keep playing should you die a few times so early in the game. Instead, it just made me decide I couldn't be bothered and I turned off the game. Basically; there was no motivation to play it any further once I'd already decided it was just going to be a pain in the *ss to do so after my experience within the first 5-10 mins or so. I have no patience for that kind of sh*t.
It doesn't matter how many Final Fantasies, Tales of whatever, or Mass Effects that I play. To me this will forever be my first, favourite, and best RPG that I've ever played. I often call Super Mario RPG my "gateway drug", because it was the first RPG title of any kind I ever played. Before then, I wrote off RPGs as "too Japanese" for my tastes, with unwieldy battle systems and overly-complex, confusing menus and item systems. Then I played SMRPG and I realized how much FUN a turn-based battle system could be. The battle with Culex piqued my interest in the Final Fantasy series, too. So I tried Final Fantasy IV next. Then Chrono Trigger. And there was no turning back. Fittingly, all of the above titles were originally from Square, so I've stayed close to those roots, but with EarthBound and Fire Emblem: Awakening under my belt, I'm still expanding my gaming horizons — and losing myself for hundreds of hours — all thanks to Super Mario RPG. @Palom I'd say that I loved him from the beginning. My most hard battle with Bowser was in SM64 where simply throwing him to the spikes with the star ground in the final battle was simply hard. But I managed to beat him and that was the best thing I ever had. Its Bowser's Inside Story where he really shines in my opinion. The second ever JRPG I ever played after Chrono Trigger. I beat this game at least 4 times, maybe 5. And even to this day, I still was learning about secrets I missed. A true classic in videogame history. I remember when it came out in the VC. One of the greatest video games of all time. Luigi was actually in the game. This was my first RPG, and my favorite game. I really want it to hit Wii U VC, and sequels with art equivalent to Mario Kart 8 would be amazing. The old art-style would be enough for me. While I don't like it as much as the Mario and Luigi titles there is no denying the quality of this game. One of the most influential rpgs ever made no doubt. I suggest you learn where on a different site or by playing the game since some visitors of this site have been trying to finish it for the very first time and may want learn about his location through their own experiences with the game. @MarvinTheMartian I saw a YouTube video on Nintendo's japan YouTube channel releasing Mario rpg in japan. Here is link to it. Best RPG starring the character. Superstar Saga is my 2nd favorite and honestly the best Mario & Luigi game. I like Paper Mario but nothing beats these 2 games when it comes to Mario RPG series. @Kirk I'm guessing the Hammer Bros beat the crap out of you? There are some tough moments, if you're not prepared. It's a game which encourages finding everything (and killing everything) before progressing. I don't suppose this game would pique your interest any further if I told you that the final boss of this game is The Military Industrial Complex...? 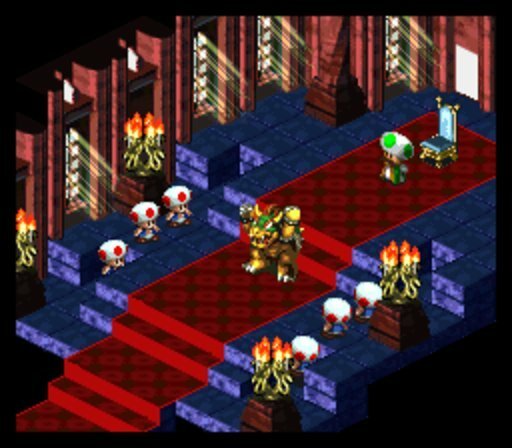 If you think the base game is too unforgiving, just be glad you didn't play the mod Super Mario RPG: Armageddon. Now that... Is a truly brutal experience. This was quite a seminal title... I liked playing it as a kid, but when I go back to it (soon to play the mod, Super Mario RPG: Armageddon), I notice some themes that a kid wouldn't pick up on, that an adult may be able to see. I never would have expected a Mario game to touch themes like spirituality, torture, forced arranged marriage, the criminal mind, the homeless, governmental corruption, and the military industrial complex. Especially that last one... I am in awe at the vision of the creative director for this game. Bravo! In case it isn't completely obvious by my avatar, this is without a doubt my all-time favorite RPG. Would kill for a 3DS port and/or a Wii U sequel. Such an incredible title that deserves more love. This was my first video game, ever. It's been a number of years since I last played it, but it's definitely among my Top 3 games of all time, if not number 1... there's just so much nostalgia for me with this game, it's crazy. @PlywoodStick I feel like I'm dying way too often, and that I don't have high enough stats most of the time, which to me suggests GRINDING, just to be high enough level to play the game without constant unfair deaths—fights you won't be prepared for or high enough stat to win unless you do some grinding upfront. I'm just not up for that; not this early in the game. I got past the Hammer Bros and now that croc dude is killing me; but I've killed most of the baddies along the way and I'm using up all the items I have on him, so it doesn't seem fair I'm going to have to grind for a while just to up my stats and hope I get to a high enough level to beat him, after the third attempt. If you have to grind just to defeat pretty low level enemies, especially this early in the game, then it's just a major turn off imo. In fact, imo, you should never really have to grind in a decently designed RPG, as your levelling up should happen in conjunction with your natural progress through the game, such that anytime you reach a new area or enemy, you'd be powerful enough to beat them, as long as you play half decently. That doesn't seem to be the case here.
" I don't suppose this game would pique your interest any further if I told you that the final boss of this game is The Military Industrial Complex...?" Not that I'm aware of. Is there some significance in that, which I'm missing? @DiscoGentleman Well show me where I've missed a semicolon in those previous posts; where it is essential otherwise the sentence structure is wrong? I'm not above learning you know. I missed a lot of basic English writing when I was at school. I honestly don't even know half the terms they use; like what nouns, verbs, adjectives, clauses, and all that crap are. I have to look stuff up most of the time just to even kinda have a clue or remember. I mean I'm writing a short story right now, and I spend most of my time just looking up how to use ellipsis, semicolons, em dashes, and whatever else. It's genuinely a wonder that I can even form a sentence sometimes. I'm not even kidding. So, feel free to take some of the stuff I've written badly above and give me examples of how it could be written better or more correctly. It will really help me with the short story I'm writing; in making sure it's as correctly written and as easy to read as possible. @Kirk All five times that you used a semicolon in post #27, a comma would be more appropriate. Maybe DiscoGentleman can help you more, since I tend to only notice when they're out of place. What I never understood is why the keyboard's set up so that you need the shift button for a colon, but not for a semicolon. It seems to me like colons are much more common, so it should be the other way around. @Nintendood I thought you could use semicolons just as slightly longer pauses than commas if you wanted? Although, that dude is one to teach us about proper English: "A semicolons NEVER should be used". Nice! I swear I read that somewhere though, that you could use semicolons for slightly longer pauses. The fact he mentions it probably means the belief that you could use a semicolon for longer pauses did come from somewhere originally, I would imagine, such that people continue to make the mistake now.